Oracle Elevator Company started in 2004 and has become the largest and fastest growing independent elevator maintenance and repair contractor in the United States. With the technical resources to maintain all types of elevator equipment, they currently have over 10,000 maintenance contracts. 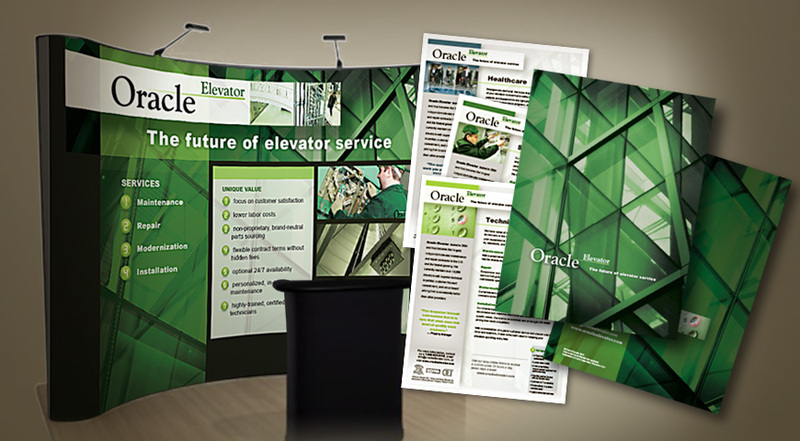 Design Corps worked with BauerWerks (marketing) and Young & Associates (copy writing) to get quality marketing materials into the hands of Oracle Elevator’s 260+ sales people as quickly as possible. Phases included producing a sales package folder, print on demand customizable sell sheets, trade show booth graphics, and Power Point templates. Along with crafting the design, Design Corps participated in regular meetings to assist in determining content needs and visual organization and followed through with managing all print production.